Being a web analyst is a real challenge. It combines so many different fields, skills, and responsibilities that it’s easy to get lost. We’ve put all the heads in our team together and brainstormed about the toughest issues every web analyst has to tackle. You’re probably a master when it comes to analyzing and managing data – after all, that’s your bread and butter. But there are some other, different challenges you face from time to time. They may demand that you prepare a step-by-step plan. That said, there’s no reason to start from scratch. You can use them as a starting point and inspiration for your own work and save them on your computer, so they’re always at hand when needed. Below each graphic version, you will find extended text checklist with a few more words of explanation. Enjoy! Decide whether you need On-Premises or SaaS – Consider your security needs very carefully. The SaaS model is not always appropriate for every organization or industry. Banking and finance, health care, and the public sector frequently deploy On-Premises analytics for maximum data security and user privacy. Be sure who owns SaaS data – Carefully read the terms and conditions of every SaaS vendor’s offer before making a commitment. Is analytics data exclusively yours? Is it transferred to third-party advertisers or otherwise processed and used outside your organization? Does the vendor provide for a data dump when the contract is terminated, or are you “locked in”? Get complete data – Capture the amount of traffic you need for accurate web analytics reports. Some solutions use data sampling to prepare reports using statistical averages. This isn’t a concern for high traffic volumes and unsegmented data. However, more granular reports using sampled data have a higher chance of error. That’s why it is recommended to select an analytics tool which offers reports based on unsampled data. Integrate for success – Choose an analytics solution that can be integrated with other tools used in your organization like SharePoint, AdWords and Optimizely, as well as tag management and other helpful integrations. Look for a tool that will help you save time, which really means your web analytics solution should save you money. Stay compliant! – Make sure the analytics solution that you choose is aligned with the newest EU and USA legislation. New regulations introduce stiff fines for violations. Ask a legal specialist for an expert opinion on your choices. Do due diligence – Research the company and the tools they offer to be sure they are built to last over the long haul. Products do get discontinued, and it’s always a good practice to evaluate the financial and market position of all partners you are considering doing business with. Demand customization and flexibility – Don’t settle for stock, one-size-fits-all solutions. Look for tools which can be customized for the specific requirements of your organization. More doesn’t mean better – focus on getting features that meet your needs. Know what it’s going to cost – Gather all possible information about total ownership costs before settling on a solution. Sometimes the total outlay is not clear at first glance, so do thorough research. For example, the time your team needs to implement the solution has a real impact on your bottom line. Understand SLAs thoroughly – Read all the fine print and make sure you know what your potential partners offer in their SLAs. Reaction times, uptime guarantees, and many other aspects of contracts are key aspects you need to understand thoroughly. Some SLAs can’t be adjusted! Make sure your chosen vendor is ready to adapt to your needs as much as possible. Get a trial – Don’t jump into an empty pool! Make sure your potential partner is ready to give you some time to try before you buy. 30 days is the right amount of time to see the difference a new analytics solution can make. You may also want a proof-of-concept implementation. If you’re considering a big investment, this is worth the small sum you’ll spend. Know when to use sampled data – Use data sampling wisely. High-level data (e.g. page views) can be sampled and still give you useful reports. However, more granular data (revenue, conversion rates) shouldn’t be sampled because the data sets aren’t large enough. For more in-depth insights choose a tool that supports 100% data reporting. Tag your URLs correctly – Assess exactly how each individual ad or marketing initiative you’ve launched is performing. Each time you ask users to click a link, set up tagging parameters. This includes email links, banners, ad links, landing page buttons, and others. Note that you should never tag internal links on your website! Know the difference: 1st party vs 3rd party cookies – Keep your distance from vendors that use third-party cookies as the default. First party cookies deliver far more accurate results, when 3rd party cookies may record higher numbers than in reality. Note that some new web browsers actually reject third party cookies. Place tracking code right – Make sure you tag every page correctly. Manual tagging may be a real minefield because of the potential for human error. To avoid pitfalls find and use a reliable tag manager with tools that check whether a tag is firing properly. You can also use software such as Web Link Validator to check missing tags. Get the right level of granularity – Make decisions using the most granular level of analytics data possible. The strength of your insights depends on how “up close and personal” you can get with users, so know what your tool offers. Deal with referrer spam – Deploy an analytics tool that has a method for handling referral spam, which can seriously distort your analytics data. Here’s a link to a little more about referral spam and ways to deal with it. Don’t forget to exclude internal IP – Protect the integrity of your analytics data. A common mistake to make is deploying, testing, and using analytics software without excluding your own ip addresses. At the very beginning you need to set up filters which will keep anyone from inside the organization from polluting your data. Check definitions of particular metrics – Different vendors will provide you with different names of particular metrics, especially when it comes to Visits, Visitors, Unique Visitors and Conversion. Ask your provider for a precise description of what they actually mean, so you can capture the difference and use those reports correctly. Remember about rich media – Before releasing any HTML5 video player or other rich forms of content, plan the implementation thoroughly. Use custom tags, event logs and other mechanisms to track each piece correctly. Use visit metrics rather than unique visitor – Remember that in most cases you cannot rely on the unique visitor metric. Users access your website from multiple devices, and unless they log in on your website your analytics platform will not be able to assign those visits to one particular visitor. Disable real-time reporting – Make the processing interval longer. Try 30 minutes, one hour, a day or even more, depending on the amount of data your platform collects. This will free up the power of your servers and significantly boost performance. You will not experience freezings, breakdowns, and lagging from server overload. Switch from browser archiving to a task scheduler – Use time-based job schedulers like Cron to automate your data archiving process. Your data will be processed automatically every hour. This is highly recommended if your website records more than a few hundreds actions per day. Update your software to the latest version – Remember to always keep you analytics platform updated, as every new release is designed to improve usability, security, and the user experience. Also remember to use the latest version of MySQL/MariaDB/PerconaServer and PHP 7. Delete old logs – After you’ve processed logs and extracted the reports you need, delete the old logs. You will free up your server’s space and improve overall performance. Schedule regular deletions according to your needs and decide on the number of rows to be removed during every deletion. You can also remove old archived reports to save some disk space provided you don’t need them anymore. Limit the number of tracked URLs – The more URL queries that are tracked, the greater the drain on performance. One way to limit this is by using session IDs and other parameters with random values (not relevant for your analysis) that are stored in some URLs. By ignoring these parameters, you can track visits to pages without recording each click as a new page. Allow only pre-archived segments – Set segments to be archived only from segment-creation date or last edit time. This is a recommended practice, as it helps avoid issues after adding or editing multiple segments at the same time. It will stop your platform from archiving data for a big date range, which can take over 24 hours in some cases. Move your web analytics to its own dedicated server – If you host your analytics platform on your own servers, move your installation to a Virtual Private Server or to its own dedicated host. This will improve not only speed, but can also contribute to data security. Enable database compression – Reach a good balance between I/O and CPU utilization by reducing the size of the database. Compressed data is stored on fewer pages, so queries need to read fewer pages from the disk. Use Nginx instead of Apache – Choose Nginx, as it performs better, especially when serving static content like a piwik.js library. This results from its ability to scale easily on minimal hardware, as well as resource efficiency. Provide high availability with load balancing – Balance application requests across multiple servers so no individual server becomes a point of failure. Dividing incoming traffic minimizes response times and optimizes usage of your resources. Ensure your passwords are strong – Always create strong and secure passwords. If you cannot come up with anything by yourself, use password generators (free generators can be found all over the web). Set validity periods to make sure all your team members change their passwords regularly to protect the system. Use SSH or sFTP instead of FTP – Make sure that all your connections to your vendor’s server are coded, so no one can see your passwords and logins. Nowadays it is very easy to snoop on Wi-fi networks and to sniff traffic. If you think for whatever reason that you have to use FTP, don’t store your password in the FTP software. This is easy prey for malware which may be running on Windows computers. Use https:// for all work – Things like your password, login details, and token_auth need to be protected, but server responses frequently list these items. This makes you vulnerable to someone who is monitoring traffic. If security truly matters to you, there is a straightforward solution that ensures that your API tokens and password remain private: always use https:// when connecting to your analytics platform. Restrict access to certain IP addresses – and minimize the number of files accessible with .htaccess. This is simple to do if you’re using Apache as your web server. Be careful, though, and remember that certain files must retain external access privileges. Keep software up-to-date, including your web server (whether Nginx or Apache) – Linux OS, MySQL, and PHP. Sticking exclusively to free software, like a combination of Nginx/Apache and Linux, is highly recommended. Make changes to boost security, such as using Apache’s .htaccess options or activating your operating system’s firewall. Control what kind of data is collected – Make sure your analytics doesn’t collect data such as session IDs, PII, passwords, and other sensitive information. You shouldn’t collect any data that may be used against your users and organization in the event someone gets access to your database. Develop Incident Response Plan – In case a data breach occurs, develop a written incident plan for your organization. It should include customer response messaging, media response messaging, maximum response times, expected timelines, and a list of all stakeholders and involved parties, including their specific roles/functions in case of any crisis. Create a culture of security – Implement ongoing training and education among your organization’s employees, regardless of individual roles. Outline breach scenarios and causes, recordkeeping and monitoring best practices, and proper data removal methods. Mind where your data is stored – Concerns related to US government surveillance means the location of your data matters. Make sure your information is protected from any unwanted access by intelligence agencies or industrial espionage. Keep your data in-house or in private clouds run by European service providers exempt from foreign laws like the US Foreign Intelligence Surveillance Act. No matter if you’re a web analyst, an IT administrator, a developer or a product owner, you should strive to simplify your job as much as is possible. We hope that those “web analytics checklists” will be useful for you and your team! If you like this post, please share it on your Twitter, Facebook or LinkedIn feed. 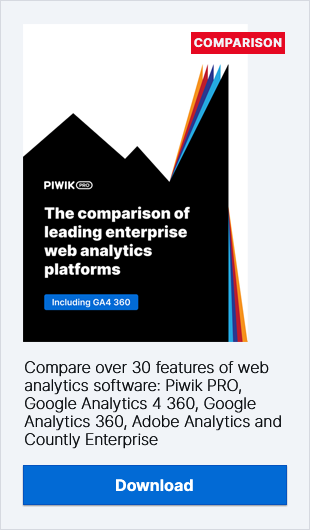 Every share is a big thumbs-up for our team and encourages us to create more actionable web analytics checklists like these ones.